November can be a really down month. There's no real celebration, in Canada anyway, to create a focus. The US has Thanksgiving, however, we had ours in October, which also has Hallowe'en. For a long time November's only focus was Remembrance Day - not exactly an up day!! 2. 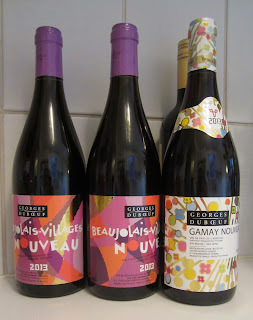 Beaujolais Nouveau - This limited offering of an unaged wine has really taken off!! The concept, which originally started in France, as a reward for the vineyard workers, has now become so popular that, if you don't get out and buy your bottles of Beaujolais Nouveau the first day they are released, you might not get any. In fact the idea is so popular that other countries are creating their own versions and there are also down market spin-offs. 3. Nanowrimo - National novel writing month picked the best month to hold its write a novel of 50,000 words in 30 days challenge. I took the bait last year and "won" in the sense that I completed the challenge with an hour or two to spare on November 30, 2012. November has few distractions. It's mostly grey and cold, so you don't mind sitting in and finding something cerebral to do!! I know, now I have to polish the text and try to get it published - another November maybe :) I do, however, get to enjoy the blog posts of others in the challenge this year - those that are not too busy writing and can spare a post or two, that is!! 4. November 25 - I had always hoped that St Catherine's Day might have become more of an event. Something like an Easter parade only in November. We could even call it Covember. St Catherine's Day is celebrated mainly in France where single women in the needle trade - sewers, milliners etc send cards to each other. Milliners have huge parades and many Catherinettes wear spectacular hats as part of the fun. It has been retained in Quebec as Taffy Day. I'm not sure how the hats and cards morphed into taffy, but they apparently have :) Also some places in Britain light a Catherine Wheel - a flaming fireworks display. Maybe the female equivalent of Guy Fawkes Day - November 5. Have a wonderful November day!! I went for the Beaujolais Nouveau once, even had my wine shop hold some aside so I would be sure to get it, alas, I was disappointed so I have put that aside. As for the turkey, there are so many ways to prepare it that once a month really is pretty good. I limit beef and pork in my menu, enjoy a lot of fish and chicken, however I like dark meat turkey so I can enjoy it often, grilled, baked in a pie, roasted with leftovers for sandwiches, etc.